Show and calculate file and folder size columns in either KB, MB, GB or TB in Windows Explorer. 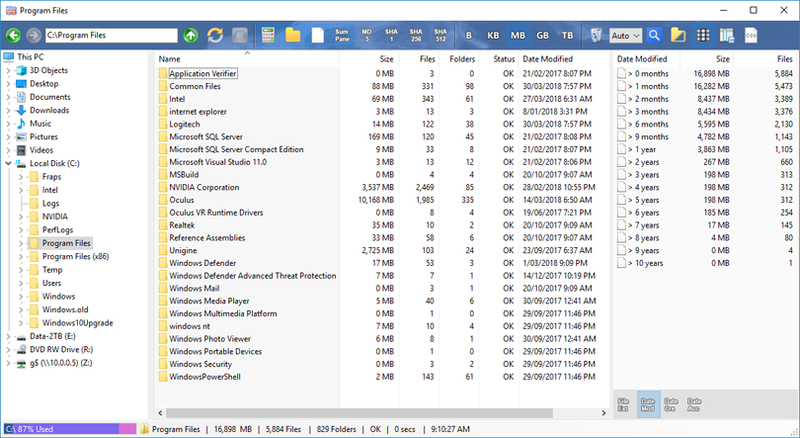 Show and calculate MD5, SHA-1, SHA-256 and SHA-512 checksum values for all files in Windows Explorer. Export and save Windows Explorer file and folder lists to a csv file. Multiple delimiters available. Autofits Explorer column sizes as you browse and navigate your files. Simple and efficient search of your files and folders based on text, size, date etc. Summary pane showing breakdown of files by extension, day, month and year. Very fast multi-threaded folder sizing with the ability to skip or cancel any folder on the fly. Supports x86 and x64 bit versions of Windows 10, 8, 7 & all versions of Windows Server 2008, 2012, 2016.